The aim of this research was to determine whether all memory T cells have the same propensity to migrate to the joint in patients with juvenile idiopathic arthritis. Paired synovial fluid and peripheral blood mononuclear cell proliferative responses to a panel of antigens were measured and the results correlated with a detailed set of laboratory and clinical data from 39 patients with juvenile idiopathic arthritis. Two distinct patterns of proliferative response were found in the majority of patients: a diverse pattern, in which synovial fluid responses were greater than peripheral blood responses for all antigens tested; and a restricted pattern, in which peripheral blood responses to some antigens were more vigorous than those in the synovial fluid compartment. The diverse pattern was generally found in patients with a high acute phase response, whereas patients without elevated acute phase proteins were more likely to demonstrate a restricted pattern. We propose that an association between the synovial fluid T cell repertoire and the acute phase response suggests that proinflammatory cytokines may influence recruitment of memory T cells to an inflammatory site, independent of their antigen specificity. Additionally, increased responses to enteric bacteria and the presence of αEβ7 T cells in synovial fluid may reflect accumulation of gut associated T cells in the synovial compartment, even in the absence of an elevated acute phase response. This is the first report of an association between the acute phase response and the T cell population recruited to an inflammatory site. Large numbers of memory T cells are found in the inflamed joint [1–3], possibly facilitated by their enhanced capacity to adhere to vascular endothelium of inflamed synovium [4, 5]. It is unclear, however, whether all memory T cells have the same propensity to migrate to the inflamed joint, independent of their antigen specificity. 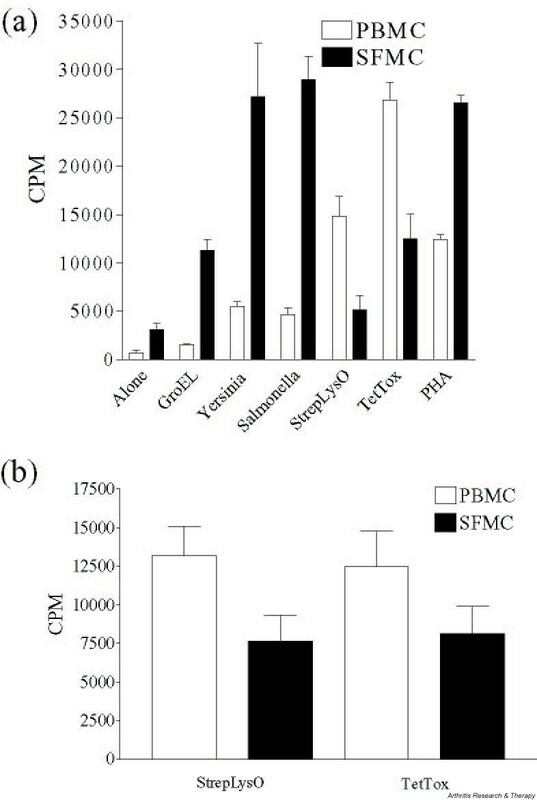 If this were the case then it would be expected that synovial fluid mononuclear cell (SFMC) proliferative responses to a wide range of antigens would be enhanced as compared with the peripheral blood mononuclear cell (PBMC) responses, provided that the individual had previously been exposed to those antigens. Alternatively, it has been suggested that patterns of antigen induced SFMC proliferation reflect an inciting or perpetuating antigenic stimulus [6, 7]. In this situation, accumulation of a specific population of T cells in an inflamed joint would be reflected by an antigen-specific SFMC proliferative response. We hypothesized that all memory T cells would have the same propensity for migration into the joint, irrespective of their antigen specificities. The aim of the present study was to test the hypothesis in juvenile idiopathic arthritis (JIA) – a group of diseases characterized by chronic inflammation of synovial joints in childhood . Forty-six samples were obtained from 39 patients who fulfilled the proposed criteria for classification of JIA  (Table 1). Paired peripheral blood and synovial fluid samples were collected after informed consent, prior to administration of intra-articular triamcinolone hexacetonide. In three patients samples were obtained on more than one occasion during the course of the study. All patients were taking nonsteroidal anti-inflammatory drugs and 13 were taking methotrexate. Twelve patients had never previously received intra-articular triamcinolone hexacetonide or other corticosteroids. Synovial fluid samples were treated with hyaluronidase. The samples were separated by Ficoll-Paque density centrifugation (Amersham Pharmacia Biotech, Upsala, Sweden) . Fresh PBMCs and SFMCs were cultured at a concentration of 2 × 105 cells per well in 96-well plates (Nunc, Roskilde, Denmark) for 6 days with a panel of antigens and mitogens in triplicate wells (Table 2). Optimal antigen concentrations were previously determined by titration. Antigens were chosen for inclusion in the panel if they had previously been linked to JIA (enteric bacteria Yersinia and Salmonella spp., human and Escherichia coli heat shock proteins [HSPs]) or if they represented common immunization or recall antigens (tetanus toxoid and streptolysin O). The proliferative responses were assessed after adding 0.15 μCi 3H thymidine (Amersham International, Little Chalfont, Buckinghamshire, UK) per well for the last 18 hours, and counting incorporated 3H in a β scintillation counter (1260 Multigamma II Gamma counter; Wallac LKB, Turku, Finland). HSP, heat shock protein; IL, interleukin. Cell staining was carried out using a standard protocol . Antibodies were purchased from Becton Dickinson (Oxford, UK: CD3PE, CD4Bio, CD8Bio, αβ FITC, γδ FITC), Dako Ltd (High Wycombe, Buckinghamshire, UK: CD45RO PE, αEβ7 FITC, isotype controls), Southern Biotechnology Associates Inc. (Birmingham, AL, USA: goat antimouse IgG FITC), R & D Systems (Minneapolis, MN, USA: CXCR3) and Life Technologies Ltd (Carlsbad, CA, USA). The α4β7 was a gift from Dr Walter Newman (Leukosite, Cambridge, MA, USA). The data were analyzed using WinMDI version 2.5 http://trotter@scripps.edu. Erythrocyte sedimentation rate (ESR; normal < 20 mm/hour) and C-reactive protein (CRP; normal < 5 mg/l) were determined using the Westergren and fixed point immuno-rate (Vitros CRP slide, Ortho-Clinical Diagnostics Inc., Rochester, NY, USA) techniques, respectively. Mann–Whitney and Rank Spearman's analyses were used to assess the relationship between nonpaired data. Wilcoxon tests were used to assess the relationship between paired data. 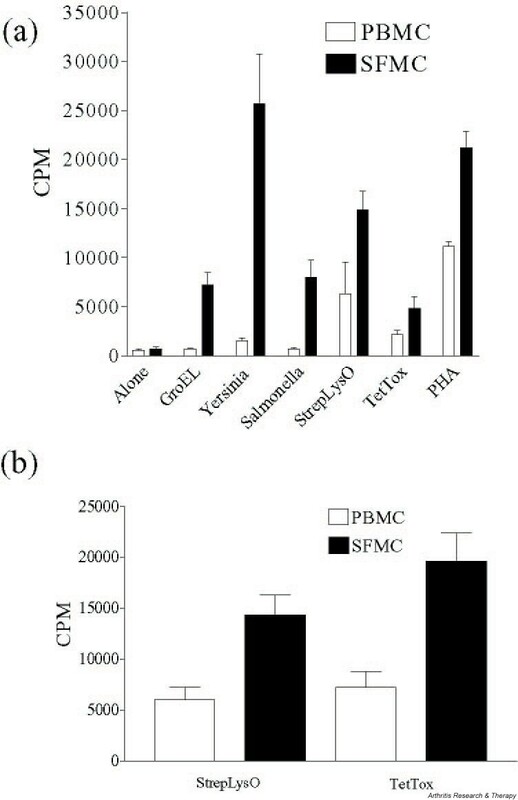 Proliferative responses to bacterial lysates, GroEL and human HSP were always more vigorous in SFMCs than in PBMCs. In contrast, proliferative responses to streptolysin O and tetanus toxoid were often higher in the PBMCs than in the SFMCs. We defined two distinct patterns of proliferation according to the pattern of response to these antigens (Figs 1 and 2). T cell proliferative responses were judged to be different between the synovial fluid and peripheral blood compartments if the standard deviation of the mean value of proliferation to at least one antigen in the synovial fluid compartment did not overlap with the standard deviation of the mean value of proliferation to the same antigen in the peripheral blood compartment. A total of 10 samples (22% of total samples) from 10 patients did not fit into either of these two patterns. In these patients, proliferative responses to both streptolysin O and tetanus toxoid were equivalent in PBMCs and SFMCs. (a) Example of diverse pattern of response to antigens. Bars indicate mean proliferation and standard deviations of triplicate values. T cell proliferative responses were judged to be different between the synovial fluid and peripheral blood compartments if the standard deviations of the mean value of proliferation to an antigen in the synovial fluid compartment did not overlap with the standard deviations of the mean value of proliferation to the same antigen in the peripheral blood compartment. (b) The proliferative responses to SLO and TT observed in the patients in the diverse group (n = 17). Responses in the peripheral blood differed significantly to those in the synovial fluid (SLO, P = 0.0002; TT, P = 0.0002). CPM, counts per minute; PBMC, peripheral blood mononuclear cells; SFMC, synovial fluid mononuclear cells. (a) Example of restricted pattern of response to antigens. Bars indicate mean proliferation and standard deviations of triplicate values. (b) The proliferative responses to SLO and TT observed in the patients in the restricted group (n = 19). Responses in the peripheral blood differed significantly to those in the synovial fluid (SLO, P = 0.0057; TT, P = 0.048). CPM, counts per minute; PBMC, peripheral blood mononuclear cells; SFMC, synovial fluid mononuclear cells. Patients with a diverse pattern of response had more vigorous SFMC proliferation than PBMC proliferation to all antigens tested. Seventeen samples (37% of total samples) from 14 patients displayed this pattern of response (Fig. 1). In patients with a restricted pattern of response, streptolysin O, tetanus toxoid or both antigens induced more vigorous proliferation in PBMCs than in SFMCs. High responses in the SFMCs were restricted to bacterial lysates, GroEL and human HSP. Nineteen samples (41% of total samples) from 15 patients displayed this pattern of response (Fig. 2). Associations between the patterns of proliferation and clinical parameters are shown in Table 3. 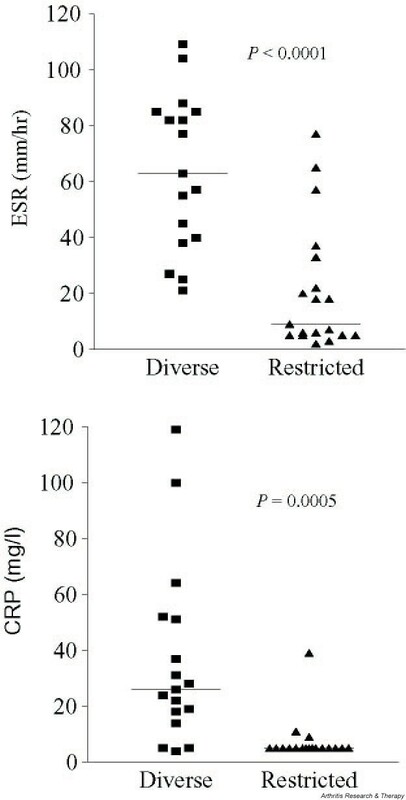 The ESR and CRP values were significantly higher in the diverse group than in the restricted group (Fig. 3), whereas measures of the acute phase response in the patients who did not clearly fit into either group were intermediate (median ESR 18 mm/hour [range 9–130 mm/hour], median CRP 5.5 mg/l [range 5–138 mg/l]). Data shows median values. *P < 0.05, **P < 0.01, ***P < 0.001. CRP, C-reactive protein; ESR, erythrocyte sedimentation rate; SF, synovial fluid. Association of proliferation pattern with acute phase response. CRP, C-reactive protein; ESR, erythrocyte sedimentation rate. Samples were obtained from three patients on more than one occasion. The pattern of proliferation varied in striking correlation with changes in the acute phase response (Table 4). Thus, patient A exhibited a restricted pattern when the acute phase was low and a diverse pattern when the acute phase was high. Patient B exhibited a diverse pattern when the acute phase was high and this was lost when the acute phase was low. Similarly, patient C exhibited a restricted response only when the acute phase was low. CRP, C-reactive protein; ESR, erythrocyte sedimentation rate. αEβ7 expression was significantly higher on the synovial fluid T cells than peripheral blood T cells (Fig. 4). Of αEβ7 expressing synovial fluid T cells, 92% were αβ TCR positive (three samples) and 94.8% expressed CD45RO (five samples). The expression of α4β7 was significantly lower on synovial fluid T cells than on peripheral blood T cells (Fig. 4). The α4β7 integrin was expressed on both naïve and memory phenotype T cells. In three samples, 49% of peripheral blood CD45RO T cells and 23% of synovial fluid CD45RO T cells expressed α4β7. A higher percentage of synovial fluid CD8+ T cells than of CD4+ T cells expressed αEβ7 (CD8+ 18.7%, CD4+ 2.6%; P < 0.0001) and α4β7 (CD8+ 47.0%, CD4+ 21.7%; P < 0.0001). Total integrin, TCR and CXCR3 expression on peripheral blood (PB) and synovial fluid (SF) T cells. Expression of the proinflammatory chemokine receptor CXCR3 was variable on synovial fluid and peripheral blood T cells (Figs 4 and 5). CXCR3 expression was significantly increased on synovial fluid CD4+ T cells as compared with peripheral blood CD4+ T cells (P = 0.006). Integrin, TCR and CXCR3 expression on peripheral blood (PB) and synovial fluid (SF) T cells. Histograms represent paired samples from one patient with restricted response. The majority of T cells in both compartments expressed αβ TCR (Fig. 4). However, a higher percentage of synovial fluid T cells expressed γδ TCR (Fig. 4). A higher percentage of synovial fluid CD8+ T cells than of CD4+ T cells expressed the γδ TCR (CD8+ 7.4%, CD4+ 1.5%; P < 0.0001). 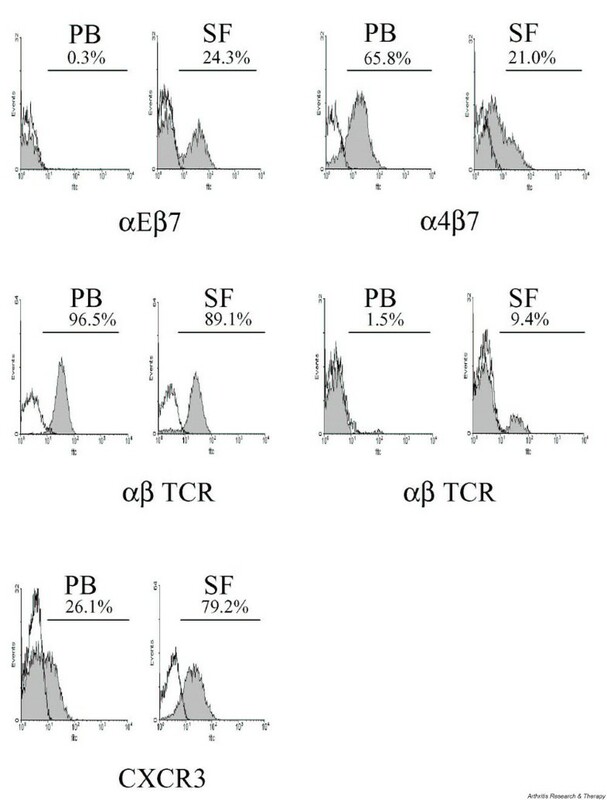 The percentage of T cells expressing the γδ TCR was higher in the restricted group than in the diverse group (14.1% and 8.4%, respectively; P < 0.05), but no differences were observed for the expression of either αEβ7 or α4β7. There was a trend toward greater expression of CXCR3 on synovial fluid T cells from the restricted group but this did not reach statistical significance. The majority of synovial fluid T cells from patients with JIA are of the memory phenotype . Memory T cells have an increased capacity to bind to inflamed endothelium because of increased expression of adhesion molecules and chemokine receptors . Previous studies of patients with JIA and reactive arthritis demonstrated that antigen-induced T cell proliferative responses were usually more vigorous in the synovial fluid than in peripheral blood, suggesting nonspecific recruitment of memory T cells into the inflamed joint [7, 10–12]. In contrast, we found two distinct patterns of T cell antigen responsiveness: diverse and restricted proliferation. Proliferation to all of the antigens was more vigorous in the SFMCs than in the PBMCs in the group of patients who exhibited a diverse response. This pattern of response would be expected if the synovial fluid memory T cells were recruited to the inflamed joint as a consequence of their memory phenotype rather than specific antigens. The group of patients with a restricted response, however, demonstrated less vigorous proliferative responses to TT and/or SLO in the synovial fluid compartment than in the peripheral blood. This pattern of response suggests that, in some patients, memory T cells specific for TT or SLO preferentially remain within the peripheral blood compartment (i.e. synovial fluid T cells may not be recruited to the inflamed joint as a consequence of their memory phenotype alone). We observed a striking association between the pattern of proliferation and the acute phase response; those patients with a high acute phase response exhibited a diverse pattern, whereas those with little or no acute phase response tended to show a restricted pattern of responses to the antigen panel. This was supported by studies of serial synovial fluid and peripheral blood samples from three patients, in whom a high acute phase response was associated with a diverse pattern that reverted to a restricted pattern when the acute phase proteins normalized. Possible explanations for this association may lie in the direct actions of the acute phase proteins themselves, or indirectly via factors that govern the acute phase response. CRP has chemotactic properties for leucocytes  and T cells may bind directly to CRP, resulting in inhibition of T cell function [14, 15]. Although CRP does not accumulate at high concentrations within inflamed tissues , it is possible that circulating CRP or other acute phase proteins exert a direct action on T cells in the peripheral blood. Acute phase proteins may influence the expression of adhesion molecules on joint endothelium, and T cells and chemokine expression within the joint. Serum amyloid A may accumulate in inflamed tissues where it can act as a chemoattractant for neutrophils, monocytes and lymphocytes, and it is possible that the accumulation of activated CD14+ monocytes may contribute to the different proliferative patterns seen [17–19]. Also, JIA patients with systemic disease have increased chemokine expression in the synovial fluid . Tumour necrosis factor-α, which correlates with acute phase protein levels in patients with JIA , has been shown to upregulate adhesion molecules on endothelial cells  as well as enhancing chemokine induced recruitment of memory T cells into inflammatory sites . It is interesting that the antigens that induced vigorous SFMC proliferation in patients exhibiting a 'restricted pattern' were those associated with Gram-negative enteric bacteria. T cells from the gut have enhanced capacity to bind to synovial endothelial cells, possibly because of shared characteristics of adhesion molecules at the two sites [24–26]. It is conceivable that, in 'restricted pattern' patients, T cells that have been through the gut or its mucosal associated lymphoid tissue, and exposed to enteric antigens, are preferentially able to bind to the synovial endothelium and are therefore selectively recruited to the synovial compartment. In 'diverse pattern' patients, however, high levels of proinflammatory cytokines, such as tumour necrosis factor-α, may upregulate chemokine-induced recruitement of all memory T cells to the synovial compartment. In this situation, vigorous immune responses may be observed to all tested antigens, and the relative specificity of proliferative responses to enteric bacteria by gut-associated T cells may be obscured. An increased percentage of JIA synovial fluid T cells expressed the mucosal integrin αEβ7 and the γδ TCRs, implying that mucosal T cells have a propensity to migrate to the inflamed joint. Mucosal memory T cells express α4β7, which facilitates homing to the gut . Once within the mucosal site, α4β7 is downregulated and αEβ7 is upregulated, which may assist in T cell retention within the mucosal site [28, 29]. The results of our studies support a similar process of 'integrin switching' in the joint. Our findings are in agreement with the observation that CXCR3, a cell surface receptor for the proinflammatory chemokines inducible protein (IP)-10 and monokine induced by interferon-γ (Mig), is expressed on JIA synovial fluid T cells [30, 31]. It is possible that CXCR3 expression favours synovial T cell accumulation in the absence of an acute phase response. We propose the following model. Proinflammatory cytokines that induce a high acute phase response also favour the recruitment of a diverse memory T cell repertoire to the joint, independent of the antigen specificity of the memory T cells. However, when there is little systemic inflammation (low acute phase response), only those T cells with an intrinsic ability to bind to synovial endothelium, such as mucosal T cells, migrate into the synovial compartment. We thank Dr Walter Newman (Leukosite, USA, now Millennium Pharmaceuticals, http://www.millennium.com) for the kind gift of the Act-1 antibody. We are grateful to Professor Mike Salmon and Professor Chris Buckley for critical reading of the manuscript. We acknowledge the financial support of the Henry Smith's Charity and the Arthritis Research Campaign.